The winner and runner-ups of World Mayor 2012 will be chosen based on the number of nominations in relation to the size of their cities and, more importantly, on the persuasiveness and conviction of testimonials received during this year's World Mayor Project. Below we publish a selection of comments received to date about WM nominee Régis Labeaume, Mayor of Québec City, Canada. 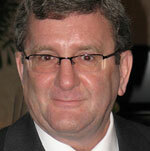 Mayor Labeaume has signed up to the City Mayors Code of Ethics. Comment: Because of Labeaume, I created a new word: Tri-Cloned ! I wish Labeaume would be "Tri-Cloned": mayor of Quebec City, Prime Minister of Province of Quebec and Prime of Canada ! Comment: Mr. Labeaume dreams of a better Quebec City. He highly succeeded in giving the population is proud back, by implenting a series of events to attrack tourists and to put the city on the map. Comment: M.Labeaume is the mayor since 2007 and since then, Quebec City and the cities close to it has evolved. The mayor brought a new whisper to our dearly city that as put us on prefer destination for tourist like never we've been before. Even if i'm not a resident of Quebec city, i live on the south shore of it and i can assure you that the decisions that he took as improve the life of us, the neighbours. But the one thing that i like the most of this man is his determination and the way he act in a non-political way. He's not like those politicians who's making promises just for grabing votes. When he says something, he's doing it. He's in control of his city and and manage Quebec City like an entreprise. That means that he's not spending money for nothing and when he does well, there's gonna be profits coming from those expenses. M.Labeaume manage Quebec City with priority and i'm convince that he's not the mayor of our city just to get a juicy pay check. He's there fod the same reason as us, he's there because he love this city. Comment: - Best Mayor in Quebec City since a long time ! etc... I could continue a lot of qualities ! Comment: The mayor can claim some remarkable achievements. He is the only Canadian mayor of recent times to have obtained hundreds of millions of dollars of public money for the exclusive profit of a future professional sports team and a media conglomerate: Quebecor. It is possibly the largest transfer of public money into private hands of recent times in Canada. In doing this he contravened many laws but managed to have the National Assembly pass a special law which grants him an amnesty on all counts. This is something which Berlusconi himself was unable to achieve. During his tenure the city's debt has risen by 30% and will have risen by 50% in 2015. This is an achievement which no other mayor of recent times can claim. Finally, he attained all this while retaining a very high level of popularity. He is a master of populist communications.